The boys were also named as the 5th seed for the state tournament. In the second round of state tournament play the boys faced off against Burlington Christian Academy. The Falcons prevailed, with goals from Manny Banigo '18 (2), Spencer Sullivan '19 (2), Bennett Moore '19, Ethan Ellis '20 and Andy Jenkins’ 19 defeating Burlington Christian 7-2. 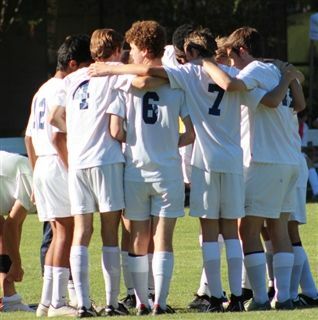 The team went on to play a fantastic game in their state quarter final match vs. Westchester Country Day School. The boys gave WCDS an almighty scare, losing 2-1, despite possessing the ball for probably close to 70 percent of the time. Coach James Franklin beams, "It was one of the proudest performances I have witnessed as a member of the O’Neal School. Our team performed with passion, resilience and a strong will to compete. They were simply terrific. They were terrific all season. Prior to coming to chat with the coaches, our student-athletes jogged back over to their opponents applauded them again, even after the end of game handshake. We might have narrowly lost the game, but we won in many, many ways. Our soccer team played their hearts out and were amazing citizens, too. I am very proud to be a Falcon." O’Neal Middle School Boys Soccer, coached by David Williamson, entered SEMSAC playoffs with a 7-1-1 regular season record. The team went on to beat St. Patrick’s 1-0 in the semi-finals. 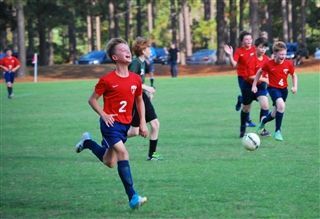 After a hard fought first half, eighth grader Andrew Druga scored off an excellent cross from seventh grader Phillip Hancock to give O’Neal a lead they would never relinquish. Reeves Cates ‘23 and Patrick McDonough ‘24 kept the St. Patrick’s midfielders in check all game while an experienced Falcon backline thwarted the few late chances that could have tied the game.